THE INDIPENDENT REPUBLIC OF CONSCIENCE is a state of mind, a place to gather people, to share and acknowledge action, and to remind politics what it is forgetting. I hope very much that you will join us on Wednesday, November 28th, 2018 to witness the creation of the INDEPENDENT REPUBLIC OF CONSCIENCE. I hope too that you will all become ambassadors of our state with no borders, no passports, and no nations. For all those of you who have followed my work since Fluxland 2016 and the series of talks we curated on board the boat, it gives me great pleasure to introduce my new venture, The Independent Republic of Conscience. Accompanying my upcoming performance installation, The Lovers of Pompeii, this new republic is inspired by Seamus Heaney’s poem and has been designed to foster collective participation in the world’s positive evolution. We formally acknowledge the terrifying state of destruction facing our planet, the impact of all our human activity, and the extreme acceleration of these processes. By creating our newly independent state and by becoming Ambassadors, we hope to ght and positively impact the future of this rapid evolution in a respectful and conscientious manner. The anthropocene utopia will be more destructive that any of the previous political utopias of the twentieth century. The trauma will be borne by all of us, it will move with respect to borders, to race, to species. There will be more natural disasters, more forced migration and more con icts due to the impending shortages of natural, necessary primary goods. Humans are but a part of the natural environment. We simply cannot continue presuming that we alone are allowed to modify nature and its ecosystems for our immediate bene ts. We cannot continue to impose an ecological debt on future generations. No political discussion can be had that continues to ignore the most obvious contemporary risk faced by mankind. We need to begin a transgenerational / trans- geographical conversation. History shows that we are not allowed to be blind. We have the responsibility and the duty to be actors in service of a better world. THE INDEPENDENT REPUBLIC OF CONSCIENCE is a state of mind, a place to gather people, to share and acknowledge action, and to remind politics what it is forgetting. We have the luxury, the duty, and the technology to invent a new conception of progress and to nd a human way to celebrate and nurture our future generations. My Eden Is A Lie, the polyhedron, a recurrent shape in Cyril De Commarque work, symbol of melancholia. One of the studies on Durer’s mentioned : ... the polyhedron designed in such a way that its vertices lie on a sphere. The systematic study of polyhedra with vertices on a sphere starts with the swiss mathematician Jakob Steiner (1796-1863) in the 19th century. In what sense is this polyhedron “round”? Cyril De Commarque plays with the idea of a perfect round world transformed by the human evolution. A symbol of our paradoxical progress system. A system in which the acceleration of progress implies at the same time the destruction of the fundamental living elements. Another ring to be added to the chain of being/ the imperfect element which represent the fragility of our present world. The permanent quest of progress is an identification of a paradise on earth, the search for a better world. But, the indubitable technological evolution a pass towards a better world is also simply destroying the essential base for life. Within the dialogue Timeo, which refers to the origins of the concept of the polyhedron, each element was associated to the four classical elements – earth, air, water and fire. My Eden Is a Lie refers to the evolution of our development and the optimism of offering a better world to future generation. ..The rapid breaking of the limit is a dramatic illustration of the illegal air pollution affecting most urban areas in the UK, for which the government is being sued in high court for the third time early in 2018. High NO2 levels are estimated to cause about 23,500 early deaths a year across the nation..
O2 is the needed formula, the base of life. Almost as if the O symbolized our planet and 2 multiplies the possibili es of life.The life we face and the life we idealize and desire, both a ected by the consequences of our ubris, but s ll needy of a en on and cure. How to face progress when it creates destruction?The consequences of the idealiza on of progress proclaimed during the 18th century, today controlled by a Foucauldian logic of power, become today our closest enemies and are transforming the utopic dream into a global illusion The paradise on earth, the Garden of Eden, will survive to the movement of cyclical destruc on or we will have to face the realisa on of Francis Bacon’s prophecy in New Atlan s, in which humans will become vic ms of their desire knowledge by viola ng the secrets of Nature? The acceleration of progress created a distance between nature and human beings, but in our deep memories, behind this process hyper-normaliza on, the relation to nature remain a fundamental element of our collective subconscious, in our liquid modernity, in which the lost paradise still survives. The statistics on the health of the world reveal an irreversible state of urgency, in which there is no more space to hide. U-topos, no-where: is the place in which we imagine to contemplate our lost paradise, referring to the island of Thomas Moore, Utopia. O2 imagined by Cyril de Commarque has the function of expressing the contrasting feeling of lost, giving a shape to the human inner desire of preserving a lost paradise into our fragile reality: a massive metal cage, a structure which is apparently - architectonically - strong, but at the same me it is fragile and unreachable, conceptually too far even if physically so close, aiming to create in the spectator a sense of disorienta on and masochis c tension in front of the object. The elements inside the cage are PM10 (particles) PM2.5 (particles), NO2 (Nitrogen Dioxide), CO (Carbon Monoxide), SO2 (Sulphur Dioxide) and O3 (Ozone). O2, 2018. 250cm x 122cm. Polished mirrored cage, neon lights, tropical plants. Fluxland is a new interactive artwork, sound piece and space for debate ideated by the artist Cyril de Commarque and launched for a programme of events in London on September 2016. The artist, who has exhibited at the MACRO in Rome and at the Venice Biennale, has created Fluxland from a former freight boat combined with a mirrored polyhedron sculptural form. The vessel travelled from north Holland to London where it navigated along the Thames through the city as a series of artistic performances, and eventually it moored in a location accessible to the public. From here the boat moved to other locations as part of the performance featuring sound installations. A space for debate and discourse, Fluxland is a pioneering project which invites us to consider and interrogate notions of progress through the intersection of art, philosophy and science. De Commarque’s Fluxland is the culmination of the exploration of the idea of progress over the last decade. The boat travelled from its docking in a Dutch shipyard to London where, in its new position, viewers were able to board and experience the immersive artwork. From its mooring in Imperial Wharf, Fluxland had several journeys over the course of a week down the Thames, reflecting the passing buildings across its angled facets, a mesmerising mirror of the city, accompanied by a sound performance. Viewers were able to watch these mesmerising journeys, and listen to the performances from the banks of the river. Fluxland takes its name from the Fluxus movement, an artistic revolution in the 1960s that sought to overturn the art establishment and to break down the boundaries between art and life. Central to the movement is the idea that art has the ability to advance and better society and that it should be accessible to all. De Commarque is inspired by Fluxus artist Joseph Beuys who stated that insert Beuys quote. The artist works with diverse media to explore both historical and contemporary conflicts and the capacity of philosophy to transcend and advance human existence. Fluxland takes the form of a polyhedron, a shape which since the age of the great ancient Greek philosophers have inspired philosophical and artistic contemplation. During the Renaissance polyhedra and the mastery of geometry and perspective became symbolic of profound philosophical and religious truths. Similarly, de Commarque’s polyhedron represents a space for meditation, thought, invention and reinvention. Sculpture, performance and talks: A series of conversations have been organized on board, to explore the relation between progress, politics and utopia. Speakers invited by Cyril de Commarque in partnership with Art Review, were: Fatima Bhutto, Elif Shafak, Héctor Abad Faciolince, Adam Thirlwell, Pankaj Mishra, Sophie Hackford, Sonia Trigueros. Talks were chaired by Mark Rappolt, editor of Art Review and Cyril de Commarque. From urbanity to nature, a metaphor of our need of introspection and a reflection on our relation to progress. VIRIDEM is a monumental installation in an urban environment. The high walls are made out of recycle plastic packs, the narrow passage makes us feel small and guides us to the heart of the sculpture through a progressive revelation of plants and sound: a place for meditation and introspection. The sound is an abstract electronic interpretation of nature mix voices and natural sounds, a memory of our childhood, a sense of pure nature. From the interpretation and idealization of the ruins taken by nature in the romantic art movement of the XIX century to the vital necessity to re-interact with nature. The piece is a metaphor for our need to recreate a form of progress based on a responsible ecosystem, VIRIDEM, a symbol for hope. An ephemeral installation the project will respond to the necessity of the location and the context. An installation that interacts with the community, constructed in partnership with local actors of the economy and with the support of local industries and institutions. Access will be free, it is a place to visit but also to come and just rest or meditate. A piece at the center of the city with and for its population. From the interpretation and idealization of the ruins taken by nature in the romantic art movement of the XIX century to the vital necessity to re-interact with nature. The piece is a metaphor for our need to recreate a form of progress based on a responsable ecosystem, VIRIDIEM, a symbol of hope. An ephemeral installation, the project will respond to the necessity of the location and the context. An installation that interacts with the community, constructed in partnership with local actors of the economy and with the support of local industries and institutions. Access will be free: it is a place to visit but also to come and just rest or meditate. A piece at the center of the city with and for its population. Construction Elements: The aim is to source locally all required materials. This will allow partnership with the local institutions and insustries for sponsorship. 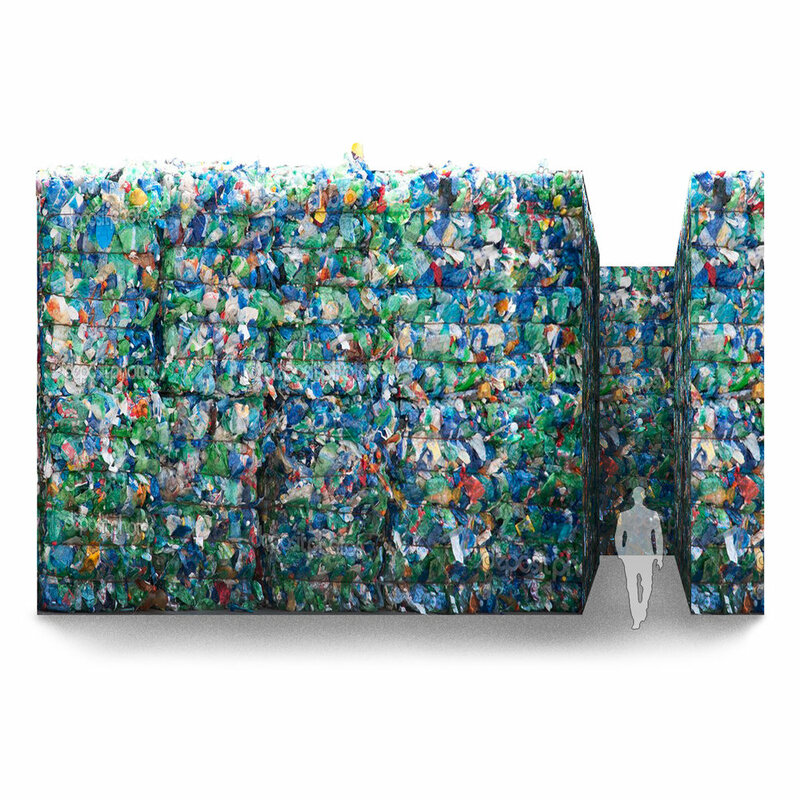 The concept is to interact directly with the local economy and the citizens of the city, using plastic which has been recycled in Turin, linking the community to its daily consumption. - Plants are sourced from local botanical gardens and garden centers. Great Pacific Garbage Patch is now three times the size of France..
"Peter Pan is the eternal inhabitant of a mysterious island where children rule: Neverland. If you have ever watched children play, you get the idea that Neverland is by no means paradise. It is just a place where a “higher order” has no say. Where there are no limits to playful, impulsive ac on and childish egoism. Like any utopia since Thomas Morus or even Platon’s Atlantis, it can be a scary place. The absence of adult life leads to totalitarian order and re ects a rule that philosophers like Augus nus and then later Husserl have de ned in terms of their consideration of ‘ me’: That closed systems must ultimately lead to in nite regress. The “endless regression” that Peter Pan stands for is a symbol for that process. Cyril de Commarque’s latest works stand in line with these observa ons: by designing an “Ever-Neverland”, where ultimately children become aggressive against themselves and destroy what they really love, he draws an eerie picture – not of a gloomy future, but in fact of our present societies. Once you think of it, it is so obvious: The growing dependency on technical devices, which govern our daily life, become our instructors, masters, controllers increasingly hold us in a state of immaturity. Has anyone thought of Larry Page as Captain Cook? For the last five years I have made it an exercise to reread Kant’s famous answer to the ques on of “What is Enlightenment?” twice a year, which he wrote in 1784, exactly 230 years ago: Enlightenment is man’s emergence from his self-imposed immaturity. Immaturity is the inability to use one’s understanding without guidance from another. This immaturity is self-imposed when its cause lies not in lack of understanding, but in lack of resolve and courage to use it without guidance from another. Sapere Aude!" Melancholia is a mental condition that more than others allows reflection and reinvention. At the same time, the polyhedron is a shape that since the age of the great Greek philosophers has inspired philosophical and artistic contemplation. During the Renaissance, polyhedral volumes as well as the mastery of geometry and perspective became symbolic of profound philosophical and religious truths. D-Melancholia wants to be the moment when we lay down our ideas, a metaphor of physical and intellectual engagement. The core of this piece is the achievement of a new perspective, where the action of thinking is an improved approach towards society. D-Melancholia comes after of Cyril de Commarque’s Fluxland. A project that takes its inspiration by the Fluxus movement an artistic revolution in the 1960s that sought to overturn the art establishment and break down the boundaries between art and life. Central to the movement was the idea that art had the ability to advance and better society and that it was imperative that art was accessible to all. The 20th century could also be described as a century of borders. Progress alloews better border control and migrants have even more difficulty rebuilding their lives; they are penned in, locked out, controlled or, otherwise, victims of the system. Migrants focuses on the psychological consequences, the feelings, the suppression, the painful inner processes. The form of Migrants is inspired by The Raft of the Medusa by Ge'ricault. As well as a simple message in a bottle - an act of despair or of hope, a rebellion against the silence. The base is a boat (with a rubber boat deck) to which bottles are tied using cables. Inside each of them beats a membrane (moulded on an actual heart). The sound of each bottle is a voice and, all together, the ensamble is drowned out by the beating hearts. The project aim was to raise public awareness about forces migration by engaging an audiance of 250,000 exibition visitors over a four month exhibition. Any refuggee were interviewed under strict anonymity. Today more than one in every hundred people are experiencing a situation of forced migration. This displacement from physical and psychological space created a suspended state of being. The sphere of the past is inaccessible, the future uncertain. Being enters a limbo state between danger and fragility fuelled by extreme emotion. Numerous people leave their country and throw themselves like bottles into the sea towards a new unknown life. Those who traverse oceans on feeble ships are the primary inspiration for this work but it also speak to all those who have had to cross frontiers due to violence or destruction. The projects hopes to raise public awareness for forced migration by engaging an audience of 250,000 exhibition visitors over the four month exhibition. Any refuggee will be interviewed under strict anonymity. The borders change, in a century the world shapehas been in constant evolution. The borders due to conflicts do move and seems to be like layers on top of each others. The consequences are forced migrations, humiliation, fights, frustration, ethnical minority but also reconciliation, peace ecc..
A series of gold-plated aluminium sculptures, idealising borders and stigmatising their evolutions: the nation symbol, the sense of nation reinforced by borders drawn as a result of war, the national ideal. It involves overlaying historical paths, incorporating the key dates in the history of a nation. The following elements are all overlaid "borders" of 13cm blades. The project Frontiers includes the following countries: Israel, Germany, Turkey, Austria, Russia and USA. 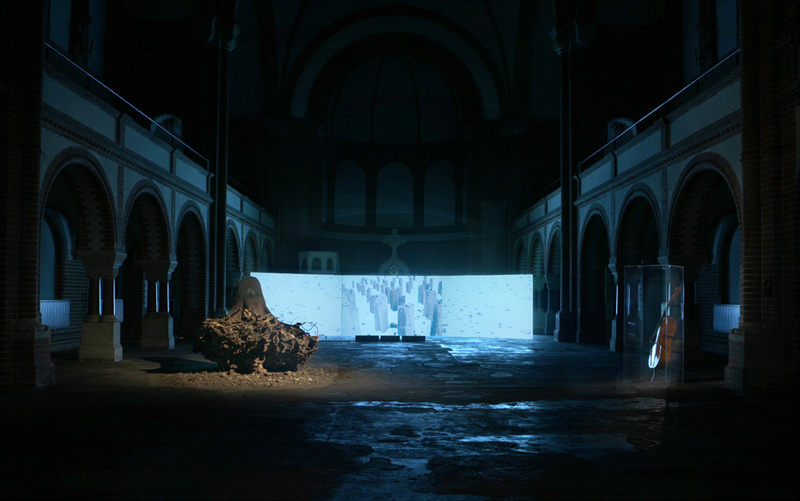 La racine perdue, le pere de mon pere.. St. Johannes Evengelist Kirche, Berlin, 2008 - From left: I) Root extracted from the Buchenwald Camp II) Video Installation projection on 3 screens 8' 40" in loop III) Audio installation 1'58"
After years of working on the destruction of nature, the recognition of the French State of certain deported persons' capacity as victim led me, to film my father in search of his father at Buchenwald concentration camp. This work would lead to the creation of the installation (video and sculpture) "La racine perdue le pere de mon pere" (Grief authorises Memory, Simone Veil); inspired by this quote, a work on grief which gives authorisation. Man is freed and can finally live. The wound heals and the next generations are "authorised to live in peace" (Konrad Adenauer). This work was the subject of several exhibitions: Y92 New York 2007, Berlin 2008, BNF Paris 2010, Memorial of Compiegne deportation 2011. At the same time as the installation mentioned above, I was also working on a sound performance in which a cello which hasn't been played since 1944 is used as a metaphor for this grief. The pores of the wood open up once more, gradually freeing the notes from the sickness, the silence. Memory frees the next generations from the weight of suffering in silence: Ecritures Silencieuses exhibition, Espace Culturel Louis Vuitton, Paris 2010. Violoncelle performance by Adrian Brendel. In the centre of a circle symbolising the globe, or Homer’s sphere surrounded by oceans, an abstract group of countries will be symbolically gathered. Each cube represents an imaginary country. A place of Oppression, lack of freedom. The interstices in the concrete let through whispers, cries, sounds of rebellions and military marches, discussion, poetry about freedom, etc. It’s an organised cacophony amid the rubble of destroyed countries. Is it not political or economic oppression which drives people onto the road? On the other hand, encouraging us to look to the skies, we will hear from above, randomly and triggered by the audience’s movements, birdsong, freedom.